This level has hard difficulty and you need to use good trick to complete this level. 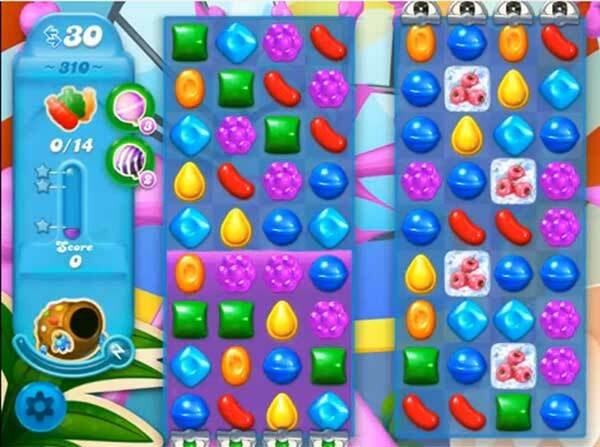 For this level you should try to play more from right bottom part of the board and make striped candy or any special candy as you get the chance. Try to make striped candy combo like combine striped candy with colorbomb or wrapped candy to break the soda bottle. Or as Sprinkleshell got full then use then to break more soda bottles to reach the target. Very unpleasant, badly made level 310 !!! I’m so tired of this level left candy crush guess soda crush will be next. Same as comments above. Have been on this level for weeks and am now totally fed up as I’ve not even been close to completing. Am done with soda crush because I’m just going through the motions with it. I am an inexperienced gamer but passed the level after some time. horrible level. I am an inexperienced player but passed the level after many attempts. horrible level! Not sure why the game is made to be so frustrating it defeats the purpose of playing and certainly defeats the “fun” element . This is probably the worst one I have experienced and am very disappointed about that??? Have been on this level for months,really fed up. Are they making it impossible to do so that you buy more moves. Nearly had enough now and won’t buy. No skill required just luck that they send enough bottles and you can get them.got 13 and just prayed the blue eaten by the creature would get the last one but no. Candy crush do something about it. Worst level ever.!!!! Not enough bottles show up! Sick of this level,very slim chance of getting past 8 bottles.shame to spoil a good game,but I’m done,this level has put me off completely! I had enough hand boosters towards the end to get enough free turns to pop enough bottles. I had a good set up though with plenty of fish. I worked on the bottom right at 1st like they said and kept them moving by making moves on the top left if I had to. My combos in the end with the hand were groups of 3 colors with 1 bottle each on the lower left. Also I ate cyan candies with my creature to get enough candies moving (so bottles would appear) and give him new life right away. I am at this level and I don’t even know what a tenth of the stuff means–I just ignore it. I have tons of boosters but never use because when I first tried they usually just made it worse. Game is totally out to get you but I rarely take more than a few days to win with no boosters. Guess it’s luck. I have no idea how to even use hands and can’t find where the 100 fish I have are or how to use them. Game usually makes you use boosters when they do the least good. Just sayin’. There are way too many great games out there to be wasting so much time trying to beat this level! Not getting my money to continue.